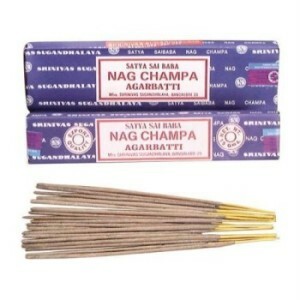 Nag Champa incense comes from India and has a very sweet and soothing aromatic scent to it. It is really good for clearing rooms of stagnant energy and can raise the ambiance of a room without being overwhelming in it’s scent. It is made in India where they have a long tradition of creating incense and knowing what works when setting the ambiance of a space that will assist in clearing and settling the mind. Of all the ones out there, the Agarbatti is the best smelling one. Some of the best incense I have used ever. It is easy on the sinuses and lungs and leaves a light and refreshing scent behind. Perfect for those who want a peaceful and calm environment while they work, or relax.